Keith Riglin and his young family arrived after two years' teaching in Jamaica. At the age of 32, it was his first church with full ministerial responsibility. As the church had virtually skipped a generation with his appointment, there were great hopes of encouraging younger families. The room in the tower was converted by the young people to be a 'den' and the morning service started to include a special part for the younger members of the congregation, based on what they would be learning in Junior Church. In 1990 Peter Townsend resigned after many years as organist and choirmaster. Eric Williams was appointed organist and Lady Barbara Banks became choirmaster. A year later the first assistant minister, Ruth Maxy who was a student, was appointed for a period of six months. Keith Riglin believed in delegation of church organisation so several committees were formed to help with the running of the church. These included the Fabric Committee which dealt with the upkeep of the church buildings, the Catering Committee which provided any food necessary for church activities and the Social Committee which was concerned with organising outings and other events. As a result of this, a new sort of outreach, Tea at Three, was started on Tuesday afternoons as a drop-in for anyone, where a friendly face, a cup of tea and a cake would be available. A monthly magazine, Free Church Family News, which subsequently replaced Crossroads, was started. Housegroups continued, these being ecumenical during Lent. The three Amersham-on-the-Hill churches (St Johns, St Michaels and ourselves) agreed to a one year trial period of sharing evening services. So far as the Free Church was concerned, money troubles loomed once again. Income was no longer meeting expenditure and the buildings needed some fairly extensive work. After much heart-searching, it was decided that the buildings would be allowed to be generally let and, by February 1993, the church was solvent again. Other changes took place including covering the open baptistry as a safety measure for small children; a large cross was placed on the church tower and the kitchen underwent a much-needed refurbishment. Possibly the crowning achievement of Keith's ministry was the signing of a flexible covenant, in 1995, between the three Amersham-on-the-Hill churches. It was to last for five years and was to lead to the three churches working more closely together. It would also enable the three ministers to conduct the sacrament of communion in the other churches. All the official and unofficial joint ventures of the past were finally enshrined in a document, agreed and instituted by the three churches. In 1996 a new church constitution was agreed. The major change was that members of Session were now all to be Elders. To keep up with current practice, a Mission Statement was produced. Later that year Church member, David Simpson, was inducted as Associate Minister. 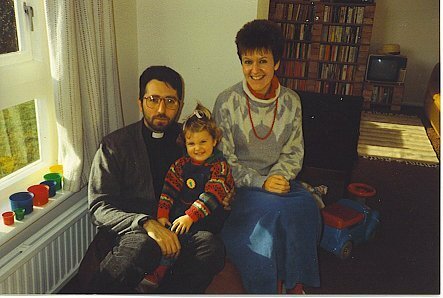 In January 1997, Keith moved to St Columba's Church in Cambridge.